In a one-hundred-year-old barn in Cornish, New Hampshire, Augustus Saint-Gaudens reshaped the memory of Abraham Lincoln in sculpture as he spent months turning blocks of clay into the 16th President of the United States. 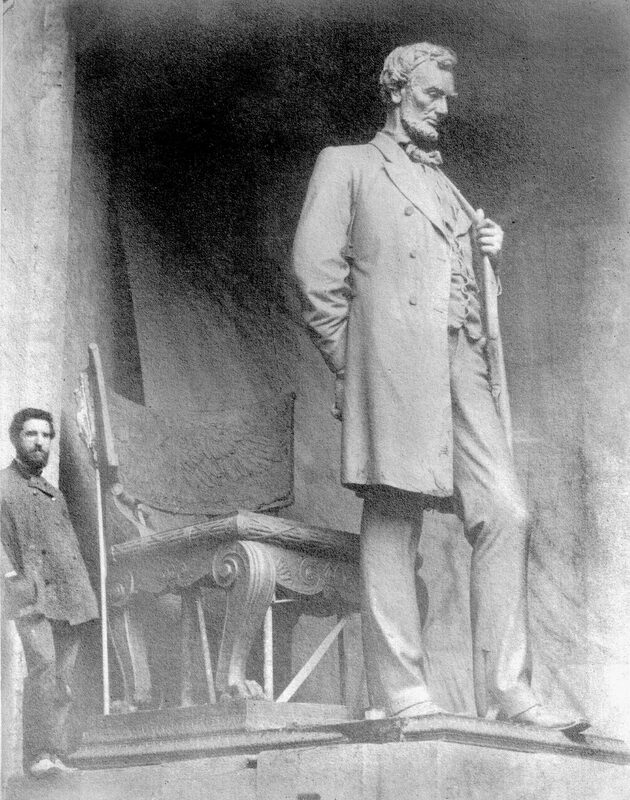 With his 1887 sculpture, Abraham Lincoln: The Man, commonly known simply as Standing Lincoln, Saint-Gaudens redirected the legacy of Abraham Lincoln in sculpture away from a romanticized Lincoln to a simplistic and naturalistic statesman, preparing to speak before an audience as he so often did. Immediately following the death of Lincoln, sculptors and patrons of the President sought to preserve his legacy in bronze and marble, beginning with many romanticized images of the slain President. Using research and personal recollections of Lincoln, Saint-Gaudens created a Lincoln recognizable by the public, not a hagiographic figure, as he relied on Lincoln biographies for artistic themes. Saint-Gaudens’s Abraham Lincoln: The Man redefined the interpretation of Abraham Lincoln in sculpture, influencing the memory and legacy of Lincoln in sculpture by reflecting numerous biographical themes of the 16th President. As he made his move to his new home and studio for the summer in Cornish, Saint-Gaudens looked for the perfect likeness and pose for his work. 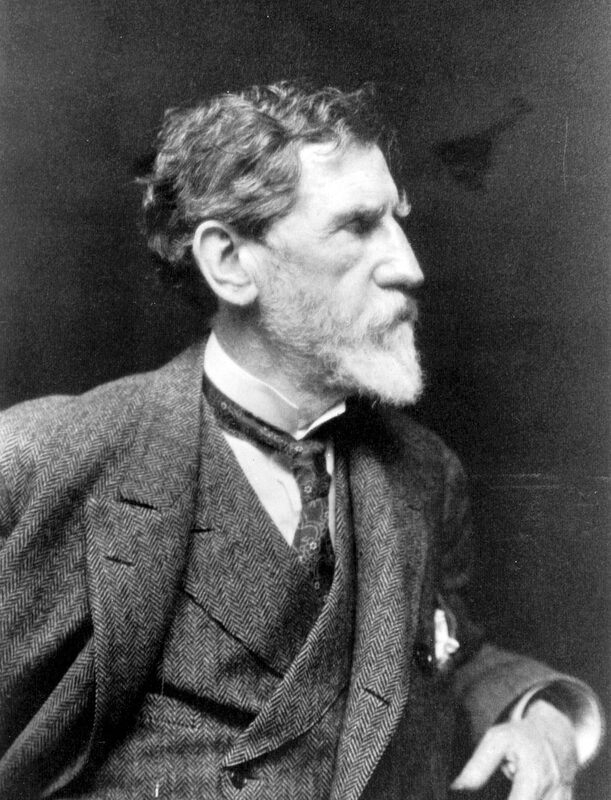 Saint-Gaudens no doubt consulted numerous photographs for the work, most likely taking the photographs of Mathew Brady with him to his summer home in New Hampshire along with his personal recollections and memories of Lincoln. Saint-Gaudens may have found the January 8, 1864 photograph of Abraham Lincoln taken by Brady useful, as it features the President standing with his left arm behind his back, a gesture added into Standing Lincoln.7 As for the “Lincoln shaped men” of New England, Saint-Gaudens found his “Lincoln” in Langdon Morse, who resided in Vermont. 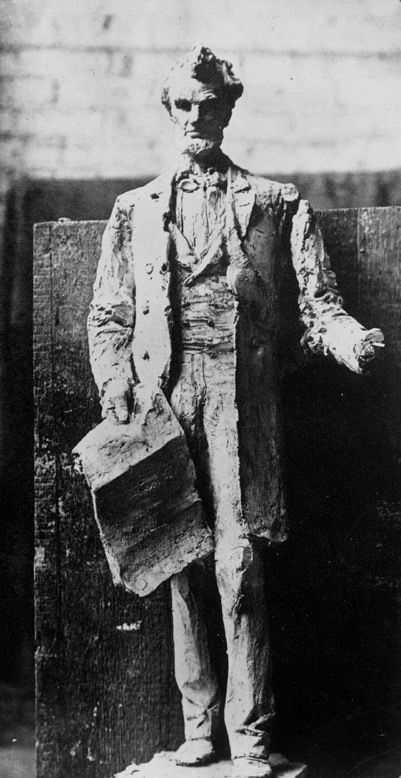 The sculptor carefully studied the physique of Abraham Lincoln, searching for a model who closely corresponded with that of the President, using Morse as his model during the duration of the creation of Standing Lincoln.8 The sculptor had his model dress in a suit accurately tailored to replicate Lincoln’s, being so meticulous as to have Morse walk around the property of his Cornish home until the clothes acquired the correct wrinkles.9 Saint-Gaudens strove for perfection in all his statues, but given the coveted status of the Lincoln commission, he went to great lengths to ensure the statue was an accurate portrayal of the President. Saint-Gaudens omitted any artificial sculptural devices in his Standing Lincoln, including items such as a scroll or parchment document, which many sculptors before him had included.20 Lincoln stands thoughtful in front of his audience, pondering what he is to say next at which he would lift his head and “tell them, out of his greater knowledge of the conditions besetting the Administration, all that he can safely publicize, and why he may not be able to grant all they ask.”21 One of the few symbols that is present in Standing Lincoln is the Chair of State that rests behind the standing figure, which reflects a strong national symbol. Saint-Gaudens intentionally oversized the Chair of State to emphasize the power of the President as well as Lincoln’s presence as President during the American Civil War. This deliberate artistic choice highlights Saint-Gaudens’s praise of Lincoln, as the sculptor no doubt recalled his memories of Lincoln. 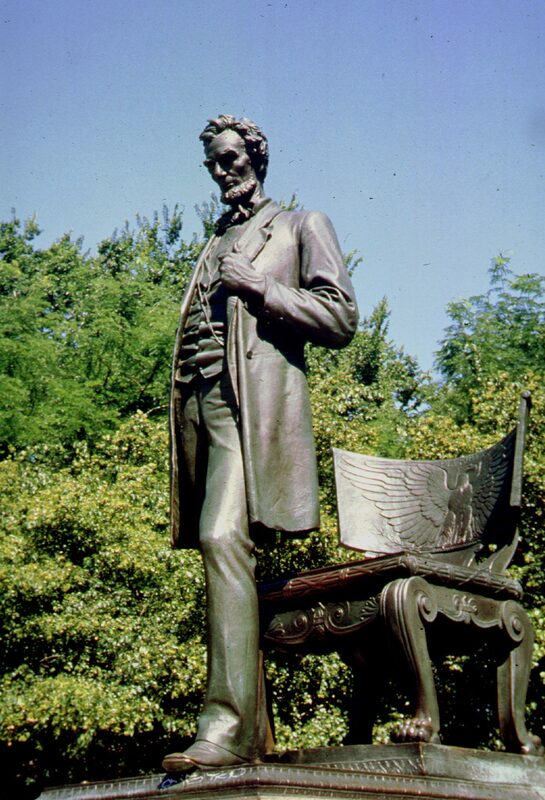 Saint-Gaudens offered his audience one of the most realistic statues of Abraham Lincoln. It is important to note that Augustus Saint-Gaudens’s Standing Lincoln pushed against the typical narrative of the life of Abraham Lincoln for the time it was created. The monument was created during an era where Lincoln’s memory was that of a martyred President, soon to become a venerated and romanticized figure and statesman. Saint-Gaudens portrays Lincoln not as a romantic figure in American history, but of a solemn statesman of the people, preparing to speak before a group of people. He stands, contemplatively thinking of his next line, prepared to address his audience. Savannah Rose is a 2017 graduate of Gettysburg College and former student of Allen Guelzo. She received a degree in History, Civil War Era Studies, and Public History. She currently works as a Pathways National Park Service Ranger at Gettysburg National Military Park, and is working towards her Masters degree at West Virginia University. Augustus Saint-Gaudens, The Reminiscences of Augustus Saint-Gaudens, ed. Homer Saint-Gaudens (New York: The Century Co., 1913), 41. Merrill D. Peterson, Lincoln in American Memory (New York: Oxford University Press, 1994), 18. “Between Augustus St Gaudens and George Payson, James C. Brooks and Thomas F. Withrow as Justices: Contract,” November 11, 1884, Dartmouth College Rauner Special Collections Library. Thayer Tolles, “Abraham Lincoln: The Man (Standing Lincoln): A Bronze Statuette by Augustus Saint-Gaudens,” Metropolitan Museum Journal 48 (January 2013): 226. Frank E. Stevens, “The Story of a Statue,” Journal of the Illinois State Historical Society (1908-1984) 24 (April 1931): 21. Lincoln Bicentennial: 1809-2009 (Cornish, NH: Saint-Gaudens National Historic Site, 2009), 9. Richard Watson Gilder to Homer Saint-Gaudens, March 25, 1909, in Letters of Richard Watson Gilder ed. Rosamond Gilder (Boston: Houghton Mifflin Company, 1916,) 149. Tolles, “Abraham Lincoln: The Man (Standing Lincoln),” 226. Kathryn Greenthal, Augustus Saint-Gaudens: Master Sculptor (New York: The Metropolitan Museum of Art, 1985), 126. Tolles, “Abraham Lincoln: The Man (Standing Lincoln),” 227. F. Lauriston Bullard, Lincoln in Marble and Bronze (New Brunswick, NJ: Rutgers University Press, 1952), 81. “Eli Bates’ Great Gift,” Chicago Tribune, October 20, 1887. “The Ceremonial,” Chicago Inter Ocean, October 23, 1887. Bullard, Lincoln in Marble and Bronze, 83. Kirk Savage, Standing Soldiers, Kneeling Slaves: Race, War, and Monument in Nineteenth-Century America (Princeton, NJ: Princeton University Press, 1997), 122. Bullard, Lincoln in Marble and Bronze, 82.